It's painful when wisdom comes through wisdom tooth. I had just been to Kolkata when a searing toothache caused by the growth of a wisdom tooth wore me down. Because of my innate fear and hatred for doctors, I ignored the first sign of pain completely without even thinking for once to visit a dentist. Consequently, the pain deepened and reached its culmination yesterday when we were travelling back to Bangalore. Just as we were heading towards the airport, I had a nasty altercation with my hubby in the taxi. Being a person of short fuse, I tossed the painkillers that my hubby bought for me in the morning out of the window. I realized my mistake shortly after the flight took off. During the entire 3 and half hours of journey, I didn't have a moment of peace. Seated on my chair, I twisted and turned in sheer uneasiness and felt the pain seething all the way from my ear to mouth. By the time we finally landed at Bangalore airport, all my other senses were benumbed with pain and all could I think of then was to reach home somehow and pop in some painkillers, which exactly I did. Right now I am literally living on soup because I find it difficult to chew. I have been to a dentist today in the first hours of morning and what looks like; it will take at least a week or two to get completely healed. I am screwing up my courage to face the day when they are going to perform an x-ray of my tooth and will come up with the verdict of what is to be done - extraction or cutting the gum around to help the tooth come up on its own. How I hate WISDOM. Note: You ought to be careful about the sugar. 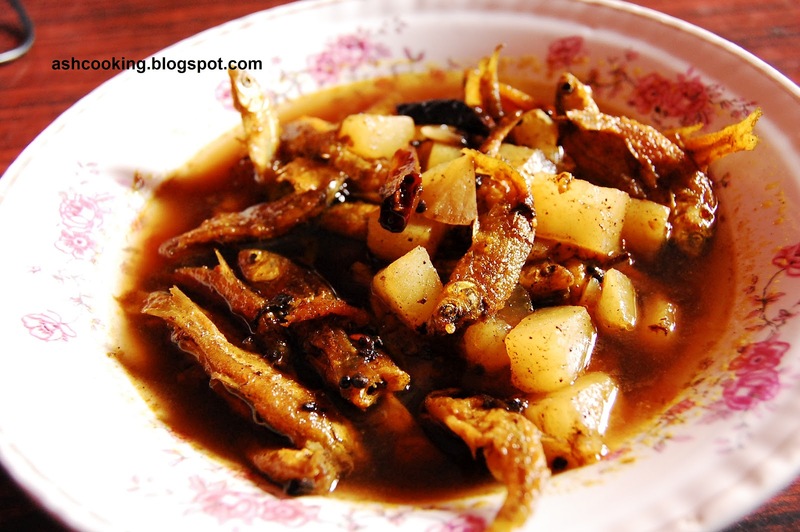 The dish will not be as sweet as a sweet dish that it overlaps the tangy taste of the tamarind. The sweetness should hit your palate with tanginess remaining intact. 1) Mix in salt and sugar with tamarind extract. 2) Rub salt and turmeric powder on the fishes and fry them crisp. Take the fishes off the heat and keep aside. 3) Into the same oil, add black mustard seeds and dry red chillies. Allow them to crackle. 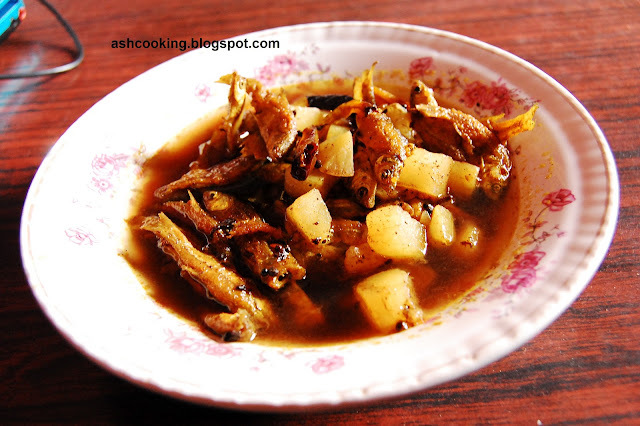 5) When potatoes turn tender, add the tamarind extract and let the gravy simmer for couple of minutes. 6) Toss in the fishes and cook covered for 1 minute. Turn the heat off. 7) Serve when it comes down to room temperature.